It is a medium-sized to fairly large deciduous tree up to 35 m tall. The bole is up to 100 cm in diameter. Acacia leucophloea is found in savanna or scrub vegetation, dry forests and teak forests, on well drained soils, between 50 to 750 m of altitude. Wood diffuse porous. Tangential diameter of vessel lumina 200 micras or more (large). Colored deposits in heartwood vessels. Vestured pits. Vessels per mm2 less than 6 (rare). Simple perforation plates. Vessel-ray pits similar to intervessel pits in size and sh Axial parenchyma in marginal or in seemingly marginal bands. Apotracheal axial parenchyma diffuse and/or diffuse in aggregates. Axial parenchyma aliform. Axial parenchyma confluent. Prismatic crystals in chambered axial parenchyma cells and/or in fibers. 4 to 10 rays per mm (medium). Larger rays more than 4 seriate. Homogeneous rays and/or sub-homogeneous rays (all ray cells procumbent). Body ray cells procumbent with over 4 rows of upright and/or square marginal cells (Kribs-I). Fibers with simple to minutely bordered pits. The heartwood is pale olive brown to pink darkening to reddish-brown or dark red with darker streaks, sharply differentiated from the pale yellowish sapwood. The grain varies from straight to slightly interlocked. The texture is fine to medium and even. This species is moderate in luster. It is durable when exposed to weather, but not in contact with ground. It is resistant to dry wood termites. Growth stresses are reported in this species. The heartwood is moderately resistant to preservative treatment. Ease of Drying: The wood dries rapidly without much degrade. Boards of 15 mm thick take about 2.5 months to air dry. 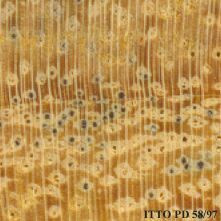 Drying Defects: It is prone to staining during seasoning. Kiln Schedules: The wood can be dried moderately fast, just like other durian timber, using schedule D (Malaysia), with only slight twisting. It is recommended to air dry sawn timber for at least 2 weeks before kiln drying. Sawing of this wood is reported to be fair to difficult. It is easy to machine. The wood planes easily to a smooth, lustrous surface using cutting angles of 15 to 25 degrees. Boring is reported to be easy. It is easy to nail. It is easy to polish. It is easy to work with hand tools.